It’s a well-understood phenomena of growing your own vegetables that you’ll inevitably end up with gluts of produce throughout the year. This season, it was beetroots. The small ones we baked in the oven with olive oil and thyme, but that still left us with some monster beetroots. The book Fermented Vegetables provided an easy solution. Organised by vegetable, this great book provides a heap of basic (and more exotic) ways of fermenting, plus recipes that make use of the results. In this case, I created a straightforward “beet-kraut”. Four big beetroots were grated in minutes, using my food processor. To that, I added half a red cabbage, to introduce the vital lactic acid bacteria. Combined with a small amount of salt, the bright red mix was packed into tall Mason jars, with airlocks. As the bacteria bubble away they produce carbon dioxide, which forces the air out of the airlock, keeping the vegetables protected against moulds. About a month later, I decanted the vegetable mix into smaller jars, for final storage in the fridge. The end result has a sharp sauerkraut hit at the front of the palette, finishing with a strong lingering taste of fresh beetroot. Delicious! This entry was posted in Cooking and tagged fermented vegetables, fermenting, pickles, pickling. One jar of chilli and garlic, ready to be fermented for a full month. If there’s one challenge about chilli plants it’s how abundant they are. A single plant can produce 100+ chillis, easily overwhelming the capacity of our household, all our friends, and fellow workmates. The obvious solution is to preserve the chillis, so they can be used throughout the rest of the year. Following my first fermented vegetables, I took the plunge, and created a jar of fermented chilli and garlic. Just a few of the chillies our one plant has produced. Wearing gloves, I finely diced approx. 275g of chillis and garlic. I measured out 2% salt, and then crushed the lot by hand until the liquid started to come out. Finely chopped, ready to be crushed by hand (wearing gloves!). Unlike the previous quick pickle, Sandor Katz recommended fermenting it for a full month, before storing in the fridge. Which we did. 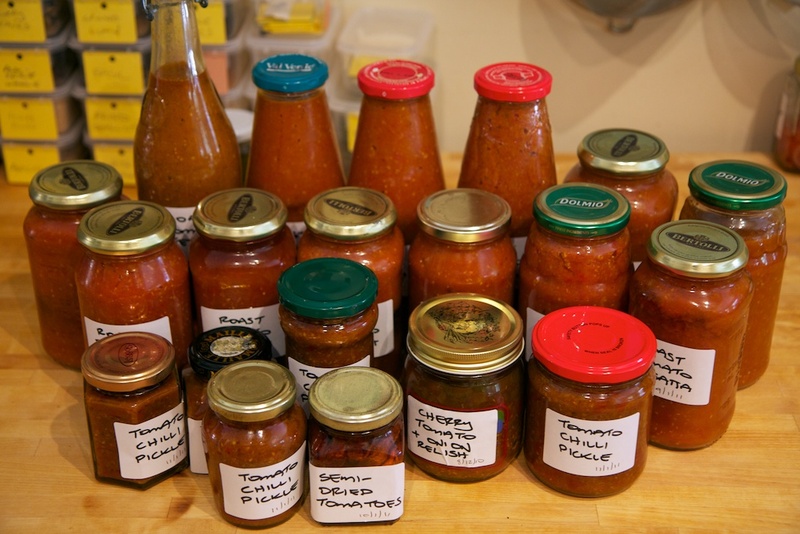 This entry was posted in Cooking, Growing our own food and tagged chilli, fermented vegetables, fermenting, pickles, pickling. There is a great love in gherkins in the household, for adding to burgers and the like. So when I saw that Digger’s Club had seeds for “West Indian Gherkins”, I jumped at the chance. The plants grew very vigorously, taking over a whole garden bed. But the fruit was odd to the say the least. Some head-scratching and Googling revealed that they weren’t the typical French gherkins, but something called a bur gherkin (also known as West Indian Gherkin or West Indian Gourd). Oops, left some of the gherkins on the vine too long! PS. the keen-eyed reader will have spotted our new jar labels, with our brand-new Lewisham House logo. More on this in a future post, and we’ll get the logo added to the website when we have a chance. This entry was posted in Growing our own food and tagged bur gherkins, cucumbers, gherkins, pickles, pickling, summer.